We here in Albuquerque, New Mexico cannot choose and do not choose to ignore that we live in the center of more than 20 Indigenous Pueblos and Nations (collectively, one of the largest indigenous landholdings in the United States) where the act of colonization, and resistance to it, is a daily reality. We therefore feel the need for a different conversation than the one the Occupy Movement is having. The people who are most marginalized in this society are and have been moving ahead with our/their own leadership embracing the practice of shared power with our/their white settler allies. We humbly suggest that the Occupy Movement is having a limited and exclusive conversation; it fails to understand its own complicity in replicating the effects and processes of colonization and racism. It puts the state (and crony capitalism) at the root of evil but doesn’t try to address historical reasons for contemporary inequalities. 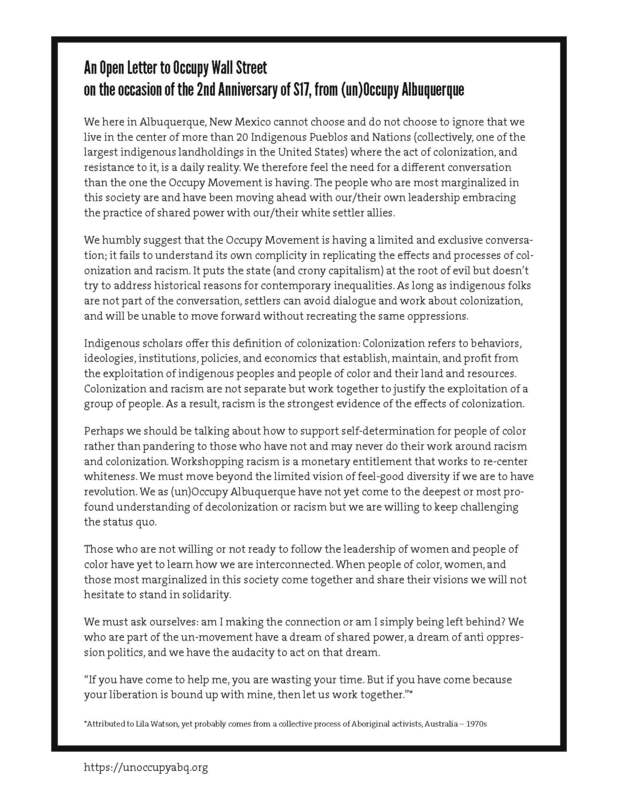 As long as indigenous folks are not part of the conversation, settlers can avoid dialogue and work about colonization, and will be unable to move forward without recreating the same oppressions. Indigenous scholars offer this definition of colonization: Colonization refers to behaviors, ideologies, institutions, policies, and economics that establish, maintain, and profit from the exploitation of indigenous peoples and people of color and their land and resources. Colonization and racism are not separate but work together to justify the exploitation of a group of people. As a result, racism is the strongest evidence of the effects of colonization. Perhaps we should be talking about how to support self-determination for people of color rather than pandering to those who have not and may never do their work around racism and colonization. Workshopping racism is a monetary entitlement that works to re-center whiteness. We must move beyond the limited vision of feel-good diversity if we are to have revolution. We as (un)Occupy Albuquerque have not yet come to the deepest or most profound understanding of decolonization or racism but we are willing to keep challenging the status quo. Those who are not willing or not ready to follow the leadership of women and people of color have yet to learn how we are interconnected. When people of color, women, and those most marginalized in this society come together and share their visions we will not hesitate to stand in solidarity. We must ask ourselves: am I making the connection or am I simply being left behind? We who are part of the un-movement have a dream of shared power, a dream of anti oppression politics, and we have the audacity to act on that dream.